Graduate students march from The Rock to Rebecca Crown Center to demand The Graduate School guarantee sixth-year research funding. Opportunities for such funding have been restricted since last year, when TGS stopped allowing sixth-year students from funding their research through assistantships. 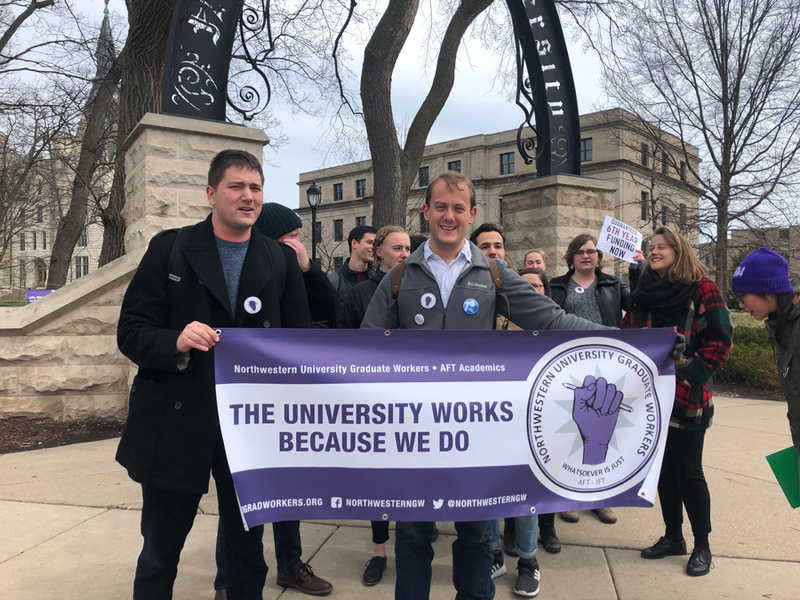 Graduate students rallied Thursday and presented a list of demands of The Graduate School during Northwestern University Graduate Workers’ first public action to lobby for guaranteed sixth-year research funding since it was discontinued last spring. Protesters marched from The Rock to Rebecca Crown Center, where Sergey Kucherenko, TGS’s associate dean of finance, met them to receive their demands in place of Dean Teresa Woodruff, who Kucherenko said was in Chicago. Kucherenko told the protesters he could “guarantee” their voices would be heard. NUGW, the University’s graduate student union, has been pushing for guaranteed funding since TGS stopped granting funding to sixth-year students through assistantships — which include research and teaching positions — last May. Though assistantships are only available to second through fifth-year students, in the past, some students were granted exceptions. In an email to graduate students last year, Woodruff said the school would no longer make those exceptions. In response, NUWG put together a letter campaign that fourth-year math graduate student Perry Kleinhenz said garnered over 250 graduate student signatures. Especially in the humanities, completing a doctoral degree is rarely something that can be accomplished within five years, said Anna Dumont, a fourth-year art history graduate student. Dumont said she doesn’t know anyone in her department that finished their doctorate in five years. While she said she knew she was entering a precarious situation by joining a graduate program, she began her research at NU assuming there would be options to apply for funding beyond her fifth year. Now, she’s having second thoughts about a project in which she’s deeply invested because of the travel costs associated with it. To make up for that, Dumont said, she’s had to apply for large numbers of fellowships — a task that distracts her from her research. The fight for sixth-year funding takes place in the midst of a $94 million budget deficit, which has led to cuts University-wide. TGS — like the undergraduate schools at the University — was directed to make a five percent cut to its budget. Regardless, many graduate students believe the University is still in a position to fund their research. Many of the students also expressed frustration that administrators weren’t listening to them. It was “ridiculous,” Yang said, that graduate students had to resort to letter writing and petitions to receive recognition from University leadership.